Gasparilla is Tampa’s signature event with annual festivities including parades, marathons, music and film festivals, and an art show. Gasparilla pays homage to Tampa’s mythical buccaneer, Jose Gaspar. More than 300,000 people were expected to attend the activities this year. Rightly so, the Tampa Police Department takes pride in reporting a lower number of arrests each year. In many ways, a lower number of arrests indicates that the event was well managed at every level with enough of a police presence to deter bad behavior. This year, Tampa Police Department has announced that just eleven (11) people were arrested during Gasparilla which is way down from the 419 arrested in 2010. Although the number of arrests on land were low, fifteen (15) people were arrested for boating under the influence (BUI) charges, according to the Florida Fish and Wildlife Conservation Commission. For the arrests on land, five felony arrests included one for felony domestic battery, two for battery on a law enforcement officer, and two for criminal mischief charges. TPD also reported six misdemeanor arrests with three for disorderly conduct, two for underage drinking, and one for resisting or obstructing an officer without violence. 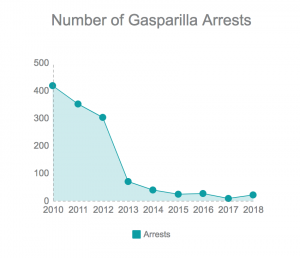 Since 2010, the number of arrests at Gasparilla on land have dropped steadily each year. This article explains the number of arrests at Gasparilla but doesn’t include the number of arrests in the areas in and around the parade route. More officers are on patrol during Gasparilla weekend, not just on the parade route, but throughout Hillsborough County and the surrounding areas as people drive home after the parade. The best way to avoid an arrest is to not drive to or from the activities. Throughout the Tampa Bay area, additional officers will be on patrol looking for drunk drivers. If you were arrested at Gasparilla or given a notice to appear in court, then contact an experienced criminal defense attorney at Sammis Law Firm. Our offices have been located at the same location in downtown Tampa for the last 10 years. With four attorneys, we focused exclusively on criminal defense in and around Hillsborough County. We are familiar with the tactics used by the local police departments during Gasparilla. Over the years, we have represented clients on the most common types of cases that occur at Gasparilla including possession of an open container of alcohol, underage possession of alcohol by a person under 21, possession of marijuana, driving under the influence (DUI), and boating under the influence (BUI). Contact us for a free consultation to discuss your case. Call (813) 250-0500. Most of the arrests at Gasparilla involve accusations of disorderly conduct and underage drinking. In 2018, one person was arrested on a felony charge of battery on a law enforcement officer. Nineteen other people had various charges for misdemeanors including underage drinking, battery, disorderly conduct and trespassing. Officers at Gasparilla gave one civil citation for marijuana possession. Deputies with the Hillsborough County Sheriff’s Office arrested four people for disorderly conduct. Two of those cases also resulted in charges for resisting without violence charges. In 2018, 15 people were arrested on boating under the influence charges, according to the Florida Fish and Wildlife Conservation Commission. In 2017, only eight people were arrested. Those Gasparilla arrests in 2017 included an arrest for disorderly intoxication, public urination, disorderly conduct, possession of an open container, criminal use of a personal ID, and battery. Two people were arrested for possession of cocaine. In 2015, 24 people were arrested during Gasparilla, with only 5 open container citations. In 2014, there were 42 arrests. In 2013, there were 131 open container citations and 68 arrests. In 2012, there were 302 arrests. In 2011, the police made 349 arrests at Saturday’s Gasparilla festivities, including 337 on misdemeanor alcohol-related violations. According to Tampa Police Department spokeswoman Laura McElroy, one person was charged with fighting, one person was arrested for trespassing, two people were arrested for disorderly conduct, and four people were arrested with boating under the influence. Three felony charges including car theft, resisting with violence, and battery on a law enforcement officer. In 2010, 415 people were arrested during Gasparilla. This article was last updated on Friday, January 25, 2019.